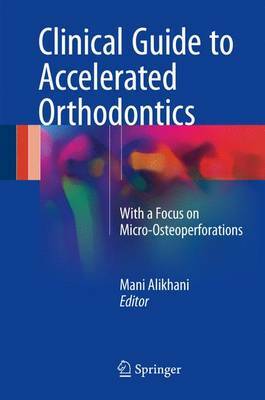 This book is a complete reference for all clinicians who are interested in incorporating into their daily practice the techniques available to reduce the duration of orthodontic treatment and to overcome other treatment limitations. It focuses especially on micro-osteoperforations (MOPs) as the most conservative, efficient, and versatile approach to increase the rate of tooth movement. The opening chapters describe the biological principles of current accelerated techniques at the molecular and cellular levels and introduce guidelines on how to select the best acceleration approach based on each patient's needs. Clinicians are then guided step by step through the application of MOPs, case selection, and treatment planning. It is explained how MOPs can be incorporated into daily mechanotherapy for the treatment of different malocclusions and how to take advantage of the catabolic and anabolic effects of the procedure to expand the boundary of orthodontic and orthopaedic corrections. The book is written in a simple and clear language with many illustrations and clinical examples to facilitate understanding of concepts and procedures. In addition, it is a rich source for academicians and researchers interested in a comprehensive and updated review on theories of tooth movement and accelerated orthodontic techniques.